With many new functions, i.e. interference analysis, many new integrated quick-tests (Check -up, E-Smog, Geopathy, Allergens, ...), it offers the opportunity to store your own programs and interferences. The therapy programs according to Dr. med. 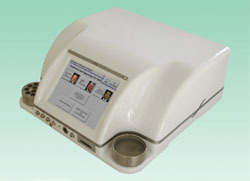 Elmar Ulrich and other special programs can be integrated in the device. You can continue using the older memory cards completely. The new patient history is certainly another outstanding achievement. You can simply look into previous sessions, analyse and repeat them, if this seems promising. For the new Rayocomp PS 1000 polar, a different music title with corresponding sounds from nature was developed to accompany each one of the 54 integrated therapy programs. You can tune your patients in on the therapy in the best way possible with the music or even apply the suitable acoustic waves via head set while harmonising. With this module, you can carry out a Meridian quick-test; based on the results, the corresponding Meridian pairs for harmonising can be selected. Also, every single Meridian point can be examined with the aid of a graphic display and harmonised. With this completely new module, complete information packs can be transferred to the organism of the patient, all based on the bio-resonance according to Paul Schmidt. The results stored in this module are based on more than 25,000 therapy sessions, all carried out and filed. Yderligere moduler er under udvikling, og når de kommer på markedet kan de let integreres af brugeren selv via en opdatering.